After six years in business, what lessons have I learned? Wow. Six years?!? Some days it feels like yesterday and other days it feels like a lifetime ago. A former colleague told me I am a very different person now than I was when I worked with her in Marketing and Communications at UI Hospitals and Clinics. That got me thinking – how am I different and what lessons have I learned during those years? 1. Business development is HARD but NECESSARY. Staying in front of potential clients while still doing a good job for current clients is a balancing act. It can be tricky. When I first started consulting, I focused much of my time and attention to meeting and exceeding my client’s expectations that I failed miserably at filling the pipeline with prospects. Truth be told, I didn’t know how to do it. But when I finished with that one client and I didn’t have another lined up – I needed to learn, FAST. One trick I find helpful now is to block time in my day and week. Focus 30 percent of my week on developing my business – this includes networking, relationship building with a variety of professionals, content marketing strategies as well as professional development. Sixty percent of my week is serving my clients (doing what I do best – helping them get to know their brand and how to build awareness). And the remaining 10 percent is service and follow-up; checking in with clients and other connections, writing thank you notes, planning for the upcoming day/week. This idea came from my business coach, Marlo Higgins. I regularly attend networking groups and participate in a few online communities that provide both business and professional development opportunities. These days I’m more selective in the groups I spend time with and know when the group will be beneficial to me and when it won’t. 2. Professional development comes in many forms. When I was in a corporate job, professional development was typically offered in the form of conferences and webinars. These opportunities were supported if there were time and budget available but were not always considered a priority. Over the last six years, I’ve shaped my own opinion – professional development is a priority. Technology and trends change so quickly it is impossible to let this slide to the back burner. I schedule it into my day – often during times when I can multitask, such as when driving to client meetings, getting ready for the day or during times that are “off hours” for my clients. I may not be attending as many conferences as I’d like, but opportunities to learn and grow are always available. I have hired two different coaches over the last six years. The first one was a great coach but not the right coach for me at the time. She was about five steps ahead of me and, frankly, she overwhelmed me. My second coach met me where I was at the time, provided me with guidance and practical suggestions I could implement into my work – and I’ve grown because of it. I listen to at least three or four podcasts a week. The topics range from meditation or marketing to customer service or entrepreneurship. (I will share my favorites in a future post.) I’m also part of several different online forums, such as Co-Commercial (a paid community) and a variety of entrepreneurial groups on social media. In addition to learning from other members, I’ve found mentors and clients by being active in these groups. Not only is this the basis of most content marketing strategies, it is true in many aspects of business and life. Provide quality content with actionable takeaways. Offer advice and support to colleagues and those around you. I know it sounds cliché but this is powerful – far more so than I had given it credit before. Helping others has always been important to me. But as a fledgling business owner, I’ve seen the benefits of giving come back to me in the form of help writing web copy, editing my blog posts, figuring out glitches in my website, design work and, most importantly, encouragement. Another way I give back is mentoring students who are participating in the University of Iowa Founders Club and the Iowa Start-Up Games. Both of these programs encourage entrepreneurship and focus on the business model canvas a means of validating the business idea. It has been such a rewarding experience and one from which I’ve learned just as much – and maybe more – than the students have learned from me. 4. Brand runs much deeper than a logo and tagline. While I’ve always held this philosophy in high regard, I now look at brand with a more critical eye. Understanding the brand of your business or even your personal brand, means you have a fundamental understanding of WHY the business exists. And using the WHY and the backstory of your business to build your brand is a foundation of authenticity. As I’ve researched this principle further, I’ve found resources such as StoryBrand, their one-liner concept and accompanying podcast as well as the book Story Driven. As a result, it is easier and easier to identify the businesses who have built their brand based on clear purpose and values and connection to their Why. One of my consulting opportunities was to work with the marketing and communications department of Hewlett Packard Enterprises Financial Services division. Through this experience, I learned about how a global corporation manages their brand, builds out all of the different elements of their brand and coordinates consistency throughout the organization. It was fascinating and gave me a broader perspective of how the success of sales and marketing is interconnected. While the vast majority of my clients are small to mid-sized businesses, I’ve drawn from the HPE brand management philosophy many times. Shortly after I started my business, I attended a conference for area entrepreneurs and met a woman who was starting a similar business in central Iowa. As I was telling her about struggling to write my own website copy, she suggested I look up Simon Sinek’s TED Talk, Start with Why. I did. Then I read the book which led to my need to understand how my own WHY grew. As my unique purpose started to become clear, I began seeing how this concept applied to brands. Those who are true to their purpose achieve more success than those who are focused on competition, money or other concepts. Understanding the WHY of my clients is now a foundation in my business. And more importantly, understanding my WHY and how it influences all the decisions I make in my life and business has been a game changer. I am able to make an assessment of whether a potential client or project is a good fit with my WHY and if it is not, I say no to the project without guilt. The time I’ve spent over the last four years helping my mother with her cancer journey is also a product of my WHY. Not only did my relationship with her grow, my conviction for service and advocacy in healthcare is deeper and more authentic. 6. Listen with compassion. Lead with empathy. This is a direct result of my WHY statement: To lead with compassion and an open heart so others succeed. I am more successful in my work and in life by approaching my clients and their circumstances with compassion. Taking the time to understand their challenges and really listening increases my ability to help them and puts us both on a path to success. One piece of advice I received that has stayed with me is that you are best able to help someone who is a couple of steps behind where you are now. This is empathy. Relating to their situation, what they are trying to achieve, while listening to identify their needs is always my starting point. No. My friend was right – I am NOT the same person I was when I walked out of the hospital as an employee in July 2012. My skills are fine-tuned. My mind is open to more possibilities. I’ve built relationships with people I’d have never met otherwise. I’ve continued to nurture long-standing relationships (nearly all of my clients have come from those relationships). By getting involved with the entrepreneur community, I’ve learned about business practices that are not traditionally applied to healthcare – so when I have the opportunity, I use them with healthcare clients. And most importantly, I understand my own personal motivations and how those ideas shape my work and personal life. 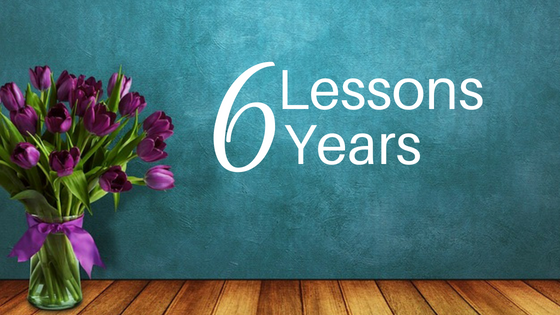 If my takeaways from six years in business are lessons you need help with, call me. I’m here.